How the intestine tells harmless food items from potentially harmful bacteria or parasites has been revealed by scientists in the US. By adding a glowing label to sugar molecules called dextrans, Washington University St Louis scientist Mark Miller and his colleagues were able to watch as small samples of the sugars were carried across the intestinal walls of experimental mice and introduced to the immune system. The work revealed, much to the scientists' surprise, that specialised "goblet cells", which were previously thought just to secrete mucus onto the gut wall, produce microscopic straws - which the team dub GAPS - "goblet cell associated antigen passages" - that draw up intestinal contents and form a conduit through the cell to the underlying tissue. 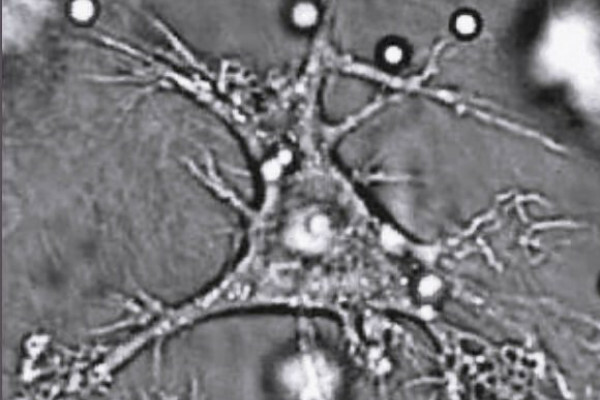 Waiting like customs officials at the ends of these structures to inspect what is passing through are immune dendritic cells. Harmless food antigens and components from so-called friendly bacteria, the team speculate, are presented steadily and at low level to these dendritic cells, helping to stimulate immune tolerance and prevent allergy. But in the face of infection, the GAPS shut down, preventing the passage of material across the intestinal wall and pushing the immune system into an "attack" rather than "tolerate" state. And if the bacteria that should be present normally in the bowel are removed, the reverse occurs and the GAPS become much more active, suggesting that healthy bacteria normally regulate this process. This might explain why allergies are more common in children given large doses of antibiotics, which wipe out the normal bacterial flora and therefore lead to exaggerated GAP activity.